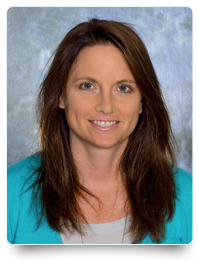 Dr. Jodi McGrady has more than 18 years of experience providing excellent dental care to people of all ages. She practiced family dentistry in Santa Fe, New Mexico for 10 years, before relocating to San Diego. She is a published author and a dedicated Mom, with a kind heart and a compassionate approach to her profession. Dr. McGrady was born and raised in Pittsburgh, Pennsylvania. She received her Bachelor of Science in Chemistry from John Carroll University. Dr. McGrady earned her Doctor of Medical Dentistry degree from the University of Pittsburgh, and then attended the University of Iowa for a general practice residency and fellowship in hospital dentistry. While at Iowa, Dr. McGrady also received a Master’s Degree in Dental Public Health, focusing on access issues for dental patients with special healthcare needs. Upon moving to San Diego in 2008, Dr. McGrady decided to pursue post-graduate specialty training in pediatric dentistry at the University of California, Los Angeles. Her program was based here in San Diego at Rady Children's Hospital. Dr. McGrady is a board-certified Diplomate of the American Board of Pediatric Dentistry. In addition to regular continuing education, Dr. McGrady has obtained certification in oral conscious sedation through the Dental Board of California. This permit is available only to dental professionals with advance training in sedating children and they must have facilities and equipment specified by the Dental Board. Each year, Dr. McGrady obtains education specific to safely sedating children, as well as avoiding and managing medical emergencies. She also maintains certification in Pediatric Advanced Life Support (PALS), which requires initial training and biannual coursework. Dr. McGrady likes to spend her free time with her family. They enjoy hiking and skiing, as well as the many outdoor activities San Diego has to offer. She also likes to stay fit by keeping up a running regimen.